Newcastle Brown Ale flavoured ice cream was launched on Tuesday by Doddington Dairies, and will only be available during the summer months. The makers say the handmade ice cream reflects the region's identity, and was even handed out to the European Capital of Culture 2008 judges on their last visit. Newcastle Brown Ale has already been used as an ingredient in locally produced products, such as bread. Although the ice cream is made using the ale, under licence from brewers Scottish and Newcastle, the cooking process means it contains less than 1% alcohol. Jackie Maxwell, director of Doddington Dairy said: "We were looking for an ice cream flavour that was distinctive, and had a strong identity with the region. "Newcastle Brown Ale has all of that. "It has been a fantastic challenge working on a product like this, with one of the world's most famous brands. "Every part of the process has been great for us - from the design of the cartons, through to testing the ale syrup for just the right flavour. 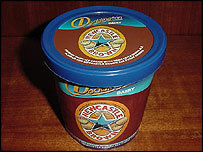 "The ice cream highlights Newcastle Brown's unique flavour characteristics." Mrs Maxwell said the product had a caramel flavour with a "subtle" taste of Newcastle Brown and said it had gone down well with the Capital of Culture judges. She added: "I think they liked it, they thought it was great. We got some feedback from the organisers and they said they had tasted it and enjoyed it." Sharon Annette, of Scottish Courage, who brew Newcastle Brown Ale, said: "Doddington Dairy are an award winning North Eastern company, Newcastle Brown is an award winning North Eastern beer. It's a perfect partnership." The Newcastle Brown Ale ice cream goes on sale at supermarkets and speciality shops across Newcastle and Northumberland from next week.